This year’s Art Of Music fundraiser in Sydney raised a total of $263,500 for the Nordoff-Robbins Music Therapy to continue its work of using music to help patients cope with physical and emotional needs. Founded by singer songwriter Jenny Morris, it is held every two years. A group of visual artists create a piece of art that was inspired by an Australian or New Zealand song. These are then auctioned off at a gala dinner. This year’s event, on June 18, was at the Art Gallery of NSW. The most spirited bidding was over Ben Quilty’s oil-on-linen portrait of Jenny Morris, which trumped $61,000. The buyer, Kate Robinson, introduced herself as a classical musician. 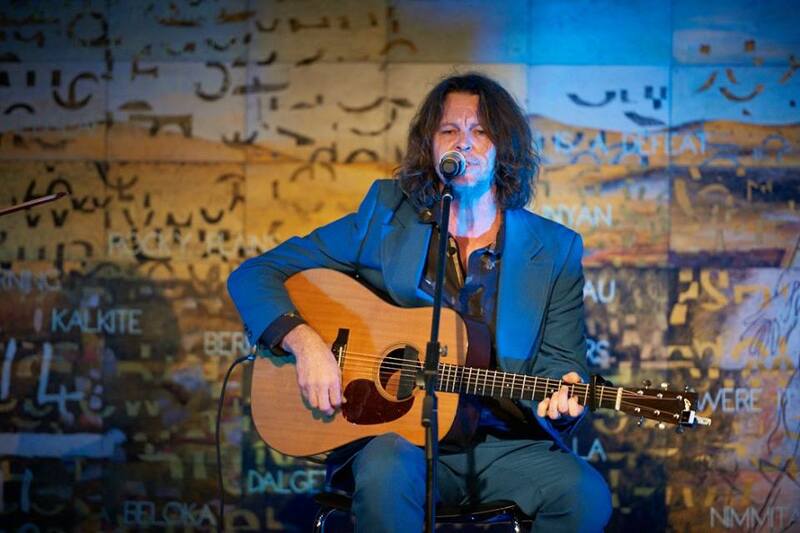 Bernard Fanning, who was about to start his performance of the night, quipped she had to be one of the few musicians who could drop that kind of money even on a good cause. Another Jenny Morris-inspired art also drew in strong bids. Alex Seton’s Carara marble depiction of two gumboots, inspired by her Break In The Weather, was bought for $30,000. Nicholas Harding’s painting of a wild sea, inspired by Midnight Oil’s stormy Surfing With A Spoon, also found a buyer for $30,000. Stan Yarramunua – $7,500 about his journey with the didgeridoo. Michael Muir – $11,000, inspired by The Cruel Sea’s Orleans Stomp. Joan Ross – $7,000, inspired Fool by Sarah Blasko. Guy Maestri – $24,000, Dead Fox by Courtney Barnet. Christian Thompson – $12,000, Sleeping Beauty by The Divinyls. Laura Jones – $20,000, How Much Does Your Love Cost? by Thelma Plum. Tim Maguire – $14,000, The Sea by Jonathan Zwartz. Lucy Culliton – $17,000, Pony by Kasey Chambers. See images of all this year’s music-inspired paintings here. Jenny Morris said, “Music therapy and its promotion is a passion of mine. It is powerful and it changes lives. I am incredibly proud to see how the Art of Music events have gone from strength to strength over the past 10 years and to see them raise over a million dollars (and still counting) for music therapy.